Methods in Mycoplasmology, Volume I: Mycoplasma Characterization is the first of a two-volume series that resulted from cumulative efforts to meet the need for standardized techniques in mycoplasmology. The book is organized into five sections. Section A provides an introduction to the mycoplasmas by discussing their characteristics and classification, mycoplasma-animal host interrelationships, and mycoplasma-plant-insect interrelationships. 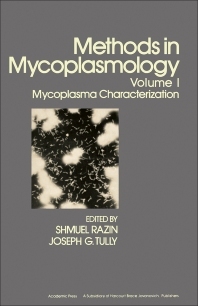 The chapters in Section B examine the morphological and ultrastructural features of mycoplasmas, using techniques such as phase-contrast microscopy, dark-field microscopy, and transmission electron microscopy. Section C discusses the cultivation and nutrition of mycoplasmas. Section D focuses on analytical methods for the characterization of mycoplasmas, including harvest and washing procedures, cell lysis and membrane isolation, and crossed immunoelectrophoresis. Section E describes tests designed to detect specific enzymatic activities or nutritional requirements of mycoplasmas. These include sugar fermentation and arginine hydrolysis tests as well as tests to establish the sterol requirement of mycoplasmas. Section F deals with serological tests. These tests either have specific application to detection of mycoplasma antigens or antibody in plant and animal tissues; are useful in identification of specific groups of mycoplasmas (spiroplasmas); or provide higher sensitivity in measurements of antibodies against mycoplasmas.